Vanyel Ashkevron is miserable at home. His father, one of the lords of Valdemar, wants him to be a warrior like the other boys in the family, but Vanyel, who’s more interested in clothes and music, wants to be a bard. After getting beat up by the armsmaster, Vanyel is sent to be fostered by his Aunt Savil who trains Valdemar’s Herald-Mages. At first he is terrified, but soon he realizes that he is finally free to discover the truths about himself. He experiences love and tragedy and, in the end, he’s a completely different person. Magic’s Pawn is the first book in Mercedes Lackey’s THE LAST HERALD MAGE trilogy which is part of her larger VALDEMAR saga. They’ve finally been produced in audio format by Brilliance Audio. Actor Gregory Nassif St. John, who is a relatively new audiobook narrator, does a great job with the narration. As far as I can tell, this is his first fiction audiobook (at least the first that’s available at Amazon/Audible) and I hope we’ll be seeing — I mean hearing — more of him. Mercedes Lackey is known for her high epic fantasy and THE LAST HERALD MAGE is classic high epic fantasy. If you’ve had enough of castles, kings, bards, swords, feudalism, patriarchy, fuzzy magic, telepathic horses, and place names riddled with apostrophes, look elsewhere. Magic’s Pawn was published in 1989 and mostly it feels like a 1989 fantasy novel. However, where it distinguishes itself a little is in Lackey’s choice of a homosexual teenage boy for a protagonist. I admire Lackey for her willingness to experiment this way with what I think of as fluffy fantasy. 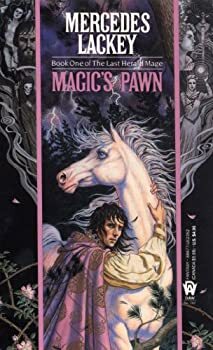 Gay characters were rare in that type of fiction in 1989, which is probably why Magic’s Pawn was nominated for the Lambda Literary Award for Gay Men’s Science Fiction/Fantasy. However, I doubt that this is really how homosexual boys want to be portrayed in fiction. Vanyel doesn’t realize that he’s gay until he gets to his Aunt’s house where he meets another gay boy, but Vanyel’s father, who has suspected his son’s orientation all along, is horrified at the thought that his son isn’t “normal.” (Thus, his poor treatment at home.) Vanyel is known among his household as an effeminate “peacock.” He’s a bit foppish and likes to dress and pose dramatically. He hides when it’s time for weapons practice, he get beat up, he whines, he broods as he reads books and plays his instruments in his secret room, he considers suicide, and he thinks about himself constantly. He’s REALLY EMO! It’s easy to feel sorry for him, but it’s hard to like him or to want to spend time listening to him feel sorry for himself all the time. (Readers who admire angsty suicidal teenagers will like this a lot better than I did.) But my point here is that I’m not sure that homosexual people will appreciate this stereotypical characterization of gay teenage boys. Vanyel is defined by his sexuality and other peoples’ reaction to it, and that’s not the right way to handle any hero. Another problem is that Lackey’s messages are so obvious and ham-fisted. The first message is that we should be tolerant and understanding of gay people. The second is that they love and bond just as deeply as heterosexual people do. That’s nice, but unfortunately these messages are so frequent and obvious that they feel like a sermon. A little subtlety would have served the tone better. Perhaps this played better in 1989, but in 2014 this story feels emo and preachy and, unfortunately, Vanyel’s sexuality is the main focus of the story. The actual “plot” seems like filler. I’m going to give Magic’s Pawn two stars. The story is simply awful, but at least Lackey did something different from most of her 1980s peers. I purchased the whole series and, say what one will re the first and second books, I found the resolution of the last book so poorly written that I had to read it three times to figure out just what happened and how. Sad to see a fine author decline this way. I first read this book when I was 13 and I loved it. Lackey is one of the writers who got me into fantasy. I will say that the message may come across as over handed now with our focus on grey characters and anti-heroes all of Lackey’s heroes are much more old fashioned. I’d definitely recommend the Valdemar books though, even though the recent ones are awful. This trilogy is still my favorite. Thanks for the comments, Tom and Ashley! Tom, I agree that the ending was a bit vague in spots. Ashley, I think “old-fashioned” is a good way of looking at it. I think you’re right that we demand more subtlety these days. The Vanyel stories will always have a special place in my heart. I read them in the late 80s when they were released, and emo aside, it was amazing to see a fantasy protagonist who was gay like me. Yes, Vanyel was OTT about many things, but in his defense, he was a teenaged boy. Is it perfect? No. But it was the first fantasy novel that I’d ever heard of with a gay protagonist, and that was so important to me in the late 80s.